(Last Updated : 09.01.19). HP SET 2018 Online Application 2019 - The Himachal Pradesh Public Service Commission (HPPSC) released HP SET 2018 Online Application 2019 of HP SET 2018 Exam to be held in 2019. The exam scheme/pattern, syllabus & exam dates of Himachal Pradesh State Eligibility Test 2018-19 can be downloaded here as per the schedule. State Eligibility Test (SET) 2018 will be conducted for determining the Eligibility for recruitment to the post(s) of Assistant Professor(s) in universities and colleges located within the State of Himachal Pradesh. All candidates who appearing in the exam can check the detailed notification of HP SET 2018 at the official website i.e. www.hp.gov.in/hppsc. Check here HP SET 2018 Result, Answer Key, Admit Card, Exam Schedule, Syllabus, Exam Pattern, Eligibility Criteria, Minimum Qualified Marks & others details are given here. Himachal Pradesh PSC has released notification for online application of of HP SET 2018 (State Eligibility Test 2019) exam to be conducted in 2019 (Sunday) in 22 subjects at various examination centres. The candidates can apply online here as per the schedule through official website of HPPSC. HPPSC will conduct State Eligibility Test (SET) 2018 in 2019 in 22 subjects at various examination centres located at Shimla, Solan, Mandi and Kangra stations of the State. Eligible candidates will be able to download their Admit Card for HP SET 2018 through official website i.e. www.hp.gov.in/hppsc. Paper-I : 10.00 A.M. to 11.15 A.M.
Paper-II : 11.30 A.M. to 12.45 P.M.
Paper-III : 2.30 P.M. to 5.00 P.M. Candidates, who will provisionally admit for HP SET 2018, can download their Admit Card along with instructions for candidates for appearing in State Eligibility Test 2018 to be conducted in 2019 at the official website by clicking the link given below. Closing Date of Online Application : 10.01.2019 11.59 P.M. Candidates can pay requisite Examination Fee either through ‘e – Challan’ or through ‘e-payment’ option. 19. Journalism & Mass Communication. Age Limit : There is no upper age limit to apply for appearing in SET. Candidates who want to apply for HP SET 2017 are required to visit at www.hp.gov.in/hppsc and click the link to APPLY ONLINE FOR STATE ELIGIBILITY TEST. Detailed instructions for filling up Online Applications are available on the above mentioned website. The candidates already registered with HPPSC for other examinations / test need not to register again and they may use said User ID and Password for applying online. 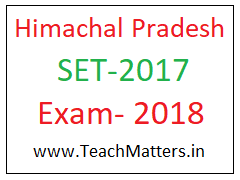 Himachal Pradesh PSC has released result & official answer key of HP SET 2018 (State Eligibility Test 2017) exam conducted on 6th May 2018 (Sunday) in 22 subjects at various examination centres. The candidates can download their answer key here as per the schedule through official website of HPPSC. The result of Himachal Pradesh State Eligibility Test 2017 conducted in May 2018 has been declared on 30.10.2018. Check here subject-wise and category-wise result. Here is official and revised answer key of Paper-1, Paper-2 & Paper-3 of HPSET Exam 2018 held on 06.05.2018. The Himachal Pradesh Public Service Commission (HPPSC) has declared the Result of HP SET 2017 (State Eligibility Test 2017) after the completion of the exam held in May 2018 in 22 subjects at various examination centres. The candidates who will qualify for HP SET 2017 as per the result will have to submit the copies of educational qualifications i.e. Matriculations, Bachelor and Post Graduation Degree with detail marks sheet and certificate of category issued by the competent authority to which they belongs, duly authenticated at the earliest to determine their eligibility so that the certificates are issued to the qualified candidates accordingly.